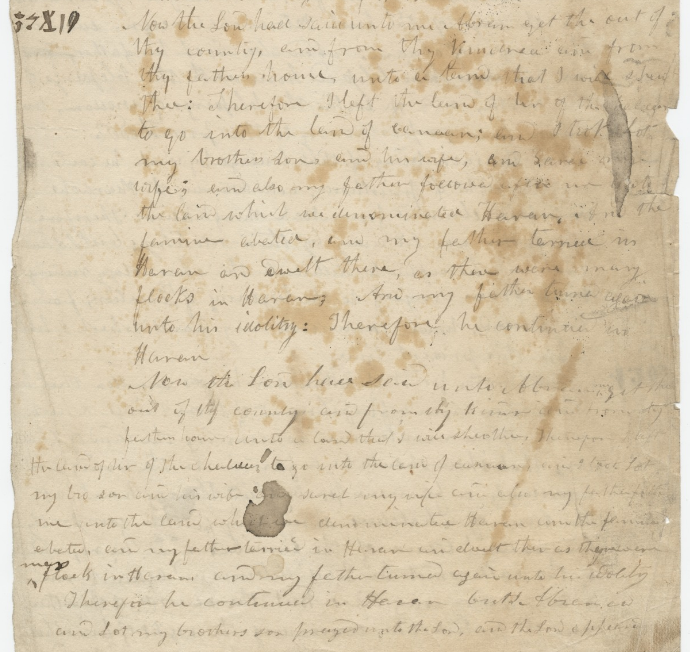 Mormanity - a blog for those interested in The Church of Jesus Christ of Latter-day Saints: Do the Kirtland Egyptian Papers Prove the Book of Abraham Was Translated from a Handful of Characters? See for Yourself! 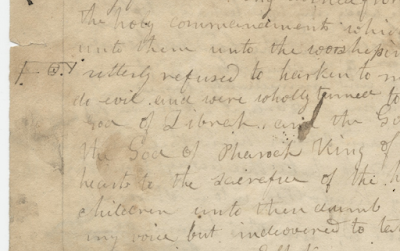 In a small but highly valuable and colorful book on the Book of Abraham, John Gee's A Guide to the Joseph Smith Papyri (Provo, Utah: Foundation for Ancient Research and Mormon Studies, 2000), Gee argues that the Kirtland Egyptian Papers (KEP), whatever they were, cannot be viewed as a window into Joseph Smith's production of his translation of the Book of Abraham. With the publication of the KEP as part of volume 4 of the Joseph Smith Papers, we now have a better chance to examine the documents and evaluate Gee's arguments. According to this theory, the text to the right is the translation of the Egyptian characters to the left. Unfortunately for this theory, the Egyptian characters were added after the entire English text was written (as evidenced by the use of different inks, Egyptian characters that do not always line up with the English text, and Egyptian characters that sometimes overrun the English text). Thus it was not a matter of writing the character and then writing the translation but of someone later adding the characters in the margin at the beginning of paragraphs of text without explicitly stating the reason for doing so. 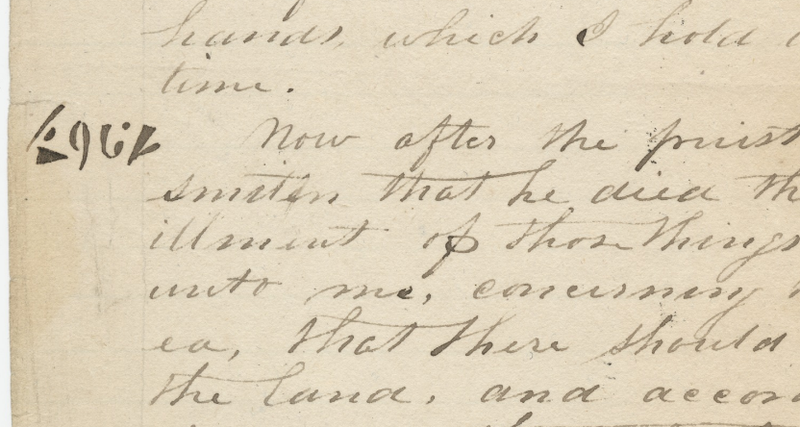 Advocates of the Kirtland Egyptian Papers theory also assume that Joseph Smith first compiled a grammar from which he then produced the translation. But when a text in an unknown language is initially translated, a decipherer usually cracks the language without the use of grammars. Grammarians then go through the translation, establish the grammatical usage, and compile a grammar. Later, individuals learn the grammar and then produce translations. 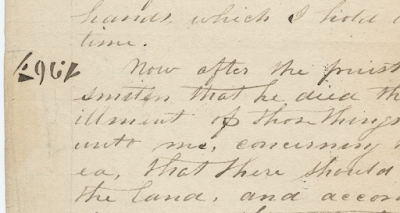 As a decipherer and one who had never formally studied any grammar at the time he produced the translation, Joseph Smith would have done the translation first. The Kirtland Egyptian Papers that have been connected with the papyri appear to be a later attempt to match up the translation of the Book of Abraham with some of the Egyptian characters (see examples on opposite page). If one assumes that the Book of Abraham was the second text on the papyrus of Hor, a possible scenario is that having the translation of the Book of Abraham, the brethren at Kirtland tried to match the Egyptian characters with the translation but chose the characters from the first text. Yet it is not certain that this is what they thought they were doing. He shows six examples of color images from the KEP that are said to demonstrate the use of different inks, characters that don't line up with the text they are supposedly generating, and characters that overrun the vertical line separating the characters from the English text. The images unfortunately are somewhat small and not in high resolution, and the online version of the book only has the text, not images. I should also note that Gee and others elsewhere have also observed that other clues such as scribal errors in the English translation further suggest that in these manuscripts, an already existing English translation was copied down, not generated. 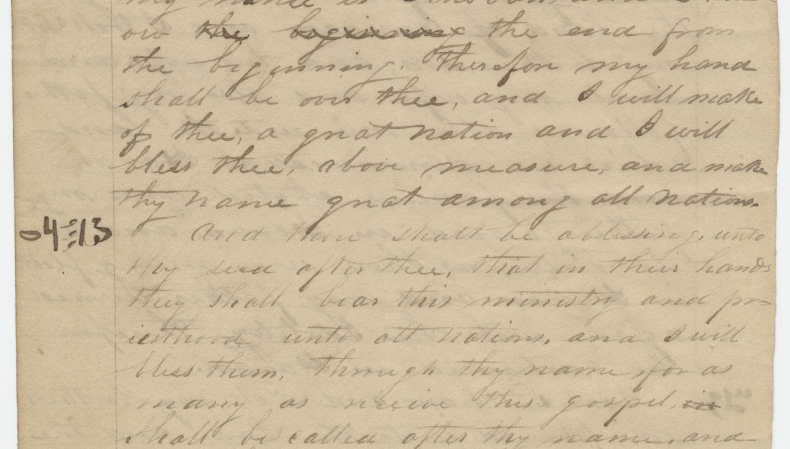 Thanks to the Joseph Smith Papers, we can now look at the KEP documents up close and better evaluate such arguments ourselves. Below are some of the features that I suggest should be considered. Document A: "Book of Abraham Manuscript, circa July–circa November 1835–A [Abraham 1:4–2:6]"
Document B: "Book of Abraham Manuscript, circa July–circa November 1835–B [Abraham 1:4–2:2]"
Document C: "Book of Abraham Manuscript, circa July–circa November 1835–C [Abraham 1:1–2:18]"
The links will take you to the online, high-resolution images. One more clue to consider up front is that these documents clearly cover only a small portion of the Book of Abraham, not the entire text. The most coverage is found in Document C which has English text from Abraham 1:1 to 2:18, representing less than 2 of the 5 chapters of the text. But let's now look at the images. Here is Sample 1 from Gee, taken from the top of page 8 of Document C. Here the Egyptian characters overrun the vertical dividing line. Some have assumed that the English is indented to avoid the Egyptian character, but indentation is common throughout for new verses or other purposes, and when Egyptian characters are placed on the text, that are often near or aligned with these natural breaks. In the caption to his photos on page 22, Gee cites this as an example where not only does the Egyptian text run over the margins, but also runs over the English text. I assume he means that the Egyptian text here extends well past the leftmost margin of the English text, rather than meaning that it overwrites any English text. An example not mentioned by Gee is readily noted on page 1 of Document A, where Egyptian again overruns the vertical dividing line, as if a dividing line were drawn for the English text on the page first, and then Egyptian was filled in, not always with enough space. Here the word "utterly" to the right appears slightly indented, but no more than the text two lines later. Indeed, most of the lines on that sheet are indented about the same amount as "utterly." The top of this sheet, shown below, shows some of the corrections made in copying this text. Interestingly, both Documents A and B have a correction made in Abraham 1:4, with "I sought for the appointment whereunto the priesthood" changed to "I sought for mine appointment unto the priesthood," the wording used in Document C. Document C has the broadest expanse of text and thus if one of these were the original source for the Book of Abraham, Document C might be the most logical candidate. Another example from Gee comes from page 2 of Document A, which is Sample 4 in Gee. This is cited as an example of different ink being used in the Egyptian than in the English, of text that runs over the margin line, and of text that does not line up with the English. Here I cannot be sure that the ink is different, for it may simply be that it has been more heavily applied in the heavy drawing on the left. Anyone up for some non-destructive chemical analysis? I'd love to have something more specific on the inks used. As for going over the margin, the degree of overrun is minor. On this page, though, two of the three Egyptian characters slightly overrun the margin line. If the margin line were drawn after the first couple of characters had been put down, one might expect it to be drawn to the right of the characters (ditto for page 1, discussed above). In general, though, it does seem reasonable that the margin line was drawn following the addition of the English text, and then came the Egyptian. There is misalignment with the beginning of Abraham 1:20 ("Behold, Potiphar's Hill was in ..."), but the Egyptian is only slightly elevated, so it's not serious misalignment. The next example from page 3 of Document A shows slight overlap of Egyptian with the margin. But it also shows that a single ink (so I presume) used for the Egyptian can create the appearance of darker ink by applying the ink more heavily, as I believe has happened here. This is not one of the examples shown by Gee, though. The image below is taken from page 5 of Document B, corresponding to Sample 2 of Gee, which is said to show different ink and margin overrun in the Egyptian. The overrun is clear, but I'm not sure about the ink. Next is an image from page 3 of Document C, corresponding to Sample 3 of Gee, said to show the use of different ink and also said to demonstrate Egyptian that does not line up with the English text. Again, I'm not sure on the ink, though it may be different. As for the alignment, I tend to agree. If the Egyptian had been written first followed by the production of an English translation, the indented beginning of a verse would presumably be directly to the right of the Egyptian. It makes sense that the Egyptian was added later in Document C, which is clearly the best candidate (however inadequate) of the three documents for the source of the Book of Abraham for those advocating the KEP theory for how the translation might have been done. The following image is from page 4 of Document C, corresponding to Sample 6 of Gee, said to show different ink and misalignment of Egyptian with the English. The ink does appear different but I'm not sure The alignment is much worse than the same text from page 2 of Document A discussed above, making this a clear example of the misalignment problem mentioned by Gee. Here is an example of a possible change in ink or at least a change in scribe during the copying of text, from page 8 of Document C.
Here is an example of the scribal errors made and corrected in the copying process from page 10 of Document C.
Scribal errors are also visible on page 9 of Document C.
Here is another example of poorly aligned text from page one of Document A. Document A at page 4 ends with a strange duplicate section where Abraham 2:3 to 2:5 is repeated, and the text begins going all the way to the left side of the page. Document B at page 6 suddenly ends with an "untranslated" character. In general, I find Gee's arguments are plausible, though it's possible the same ink was used throughout with different pens or scribes and/or with different techniques such that the Egyptian had higher ink density rather than different compositions. I would love to see some physical or chemical testing done -- there are nondestructive texts that can help identify things like the atomic species present. But considering the physical details of these documents, their incompleteness, and their lack of relationship to anything that even an unschooled farm boy could mistake as a translation (in light of his work, whether real or fictitious, with translation from a large set of plates with "reformed Egyptian" text), it seems implausible that these are giving us a window into the actual work of translation of the Book of Abraham. Yes, the characters could have been catalysts to produce the text, but we are not looking at a work in progress here, but more likely the copying of perhaps just a part of an already completed text. So why the Egyptian characters on these documents at all? Were they there for decoration? Was someone trying to find some mystic relationship between the Sensen text and the Book of Abraham text that came from a missing part of the same scroll? 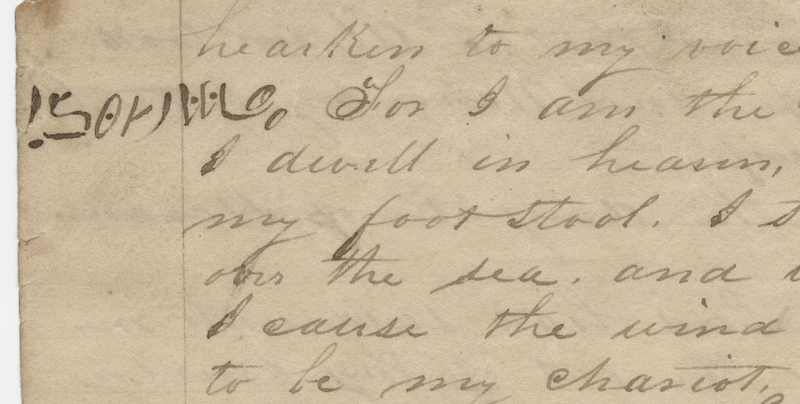 Was W.W. Phelps looking for clues to the pure Adamic language? 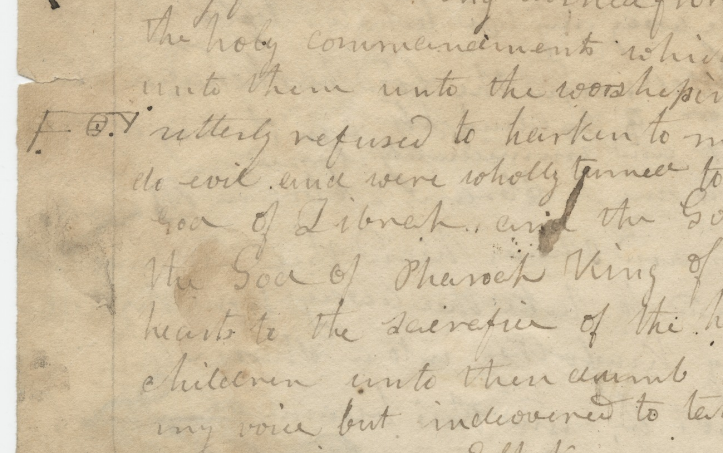 Much to speculate on, but I don't think it's fair to describe these documents as some kind of window into how Joseph Smith created the English text of the Book of Abraham. Note: Also see my later post of April 15, "The Smoking Gun for Joseph's Translation of the Book of Abraham, or Copied Manuscripts from an Existing Translation?" Actually, there could be a link between the BOM translation and the idea that one character could produce a large amount of text. David Whitmer on multiple occasions claims that JS saw one character and the translation, and according to Skousen’s research, the translation occurred in groups of words, averaging 30. Put those two ideas together and you have 1 character = about 30 words. Add to that the idea that the BOM authors say they couldn’t write in Hebrew because it took up so much space, so they used reformed Egyptian. That idea fits great with one character in the margin for a large group of text, and it also fits with the KEP. Lastly, JS didn’t even have the plates present for a fair amount of the translation, so claiming a physical parallel between plate text and translation isn’t without problems. I meant the GAEL when I wrote KEP above. "revealing his foolish belief that mystic Egyptian writing contained intricate details magically condensed into a few strokes. First, it's hard for me to believe that Joseph could have believed such a thing were possible, especially when the 'Reformed Egyptian' script on at least much of the gold plates gave no hint of such miraculously compact text." You've pointed out in the past that the "translation" of the Book of Mormon did not happen in a traditional sense. Even by his own accounts, and those of his contemporaries, Joseph would have had no idea the relationship between text on the plates and their translation--he consistently relied upon a miraculous intermediary to produce the English text. He never translated the BoM without the Urim & Thummim or his trusty seer stone, and of course, there are the accounts of the plates being in another room entirely while translation was taking place. How would such a process inform one of the relationship between a foreign pictographic text and its English counterpart? Also, I'll remind you that the claim of the BoM is that the writers used Reformed Egyptian to save space. The opening salvo to the Mormon theology goes directly to poisoning the well. Anyone who does not agree with them does not have "sincerity" and "real intent". Skeptics did not accuse the Mormons of not having deep spiritual experiences, they only pointed out that Mormons were confusing truth of principles for truth of the story. Just like the parables of Jesus were made up, but had true principles. While Mormons went about with their false facade of sweetness and smiles to hide their vicious attacks, accusing others of being defective, insincere, secret sinners, they quietly admitted they were wrong to say their spiritual experiences meant that the Lamanites were the predominate ancestors of Native Americans ... Then they admitted the Book of Mormon plates were not used in the "translation" ... Then they admitted the Book of Mormon was not even translated, but rather it is was revealed ... then they admitted they had suppressed the rock used to reveal the Book of Mormon for 150 years. But they never had the integrity to apologized for to those they falsely accused of lying for exposing the religion's suppression, despite integrity being a "true" principle. And now you can see a new generation of Mormon missionaries recorded on youtube declaring the Book of Mormon is like the parables of Jesus, even if made up, the principles are true, completely oblivious they are co-opting something that was originally criticism. Ben Britton, thanks for the comment. 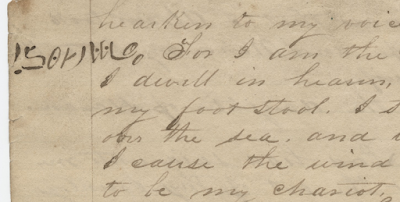 While Whitmer saw and experienced the gold plates in an ummistakable, dramatic event, he did not see whatever Joseph experienced when he translated. His descriptions of what how he thinks the translation worked are contradictory -- sometimes he speaks of characters, other times of one character at a time. But he didn't really know. Joseph, as far as we know, said essentially nothing about the process. Those closest to the translation, such as Oliver and Emma, didn't know what Joseph saw and experienced. What we can see, though, is that the the gold plates were much more than just a couple of leaves, and that the volume of text we have today could correspond with writing on the unsealed plates in small but legible Hebrew, making it certainly possible that in an even more but not bizarrely compact script could have done the job. There's nothing to suggest that Joseph thought that a page or two of the gold plates would be enough to give the whole Book of Mormon. There's certainly a relationship between the plates and the translation, however it was done. 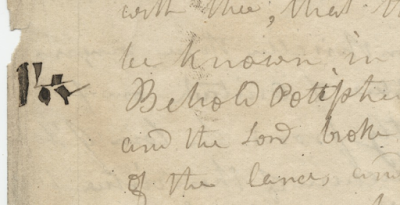 For example, the translation seems to follow the order of the plates -- title page at the end of Mormon's record, apparently the record from the small plates appended at the end. It was a real, physical record. Just as translators today don't need the physical text in front of them but can look into flowing tools like an iPad with a scanned image of the text, we don't need to mock the concept of a translation being aided by a visualization tool of some kind, whether it was virtual/mental or actually viewable in the stone somehow. -- our admission that other religions can be tools in God's hands for doing great good in the world. Admissions, admissions, admissions -- what a travesty! Or what a blessing. I choose the latter when it comes to growing, learning, and making progress. Jeff @6:38 - You forgot a couple. Now you admit that your process of learning is so colossally slow it is retarded. You admit that if your theology was not based on poisoning wells and strawmen, your "revelation" could have kept up with the rest of humanity. Better late than never, but yes it is disappointing that your process of learning was based on so much hate. If it wasn't, it could have avoided the tens of thousands online testimonies to the unhappiness it has caused. That is a good one, I will have to borrow it. Admitting that people I reviled and shamed were right does not require an apology because it is all just part of the learning process. Anon @ 3:31 appears to be celebrating, not grieving. Looking closer, Anon @ 3:31 is celebrating what they knew to be true is still true and celebrating the stability and justification that has given them in the end. Jeff @6:38 is adjusting to the loss of things he knew true which he has now accepted as not true. In aggregate, this equivalent of the loss of real friend he has now accepted as imaginary. Even if imaginary, the loss is very real and the travesty is causing Jeff considerable grief. While focusing on the birth of new beliefs is diffinitely the optomistic thing to do, it hasn't made his bereavement disappear causing him to confuse it with someone else. "There's nothing to suggest that Joseph thought that a page or two of the gold plates would be enough to give the whole Book of Mormon." Although there's nothing to suggest this about the Book of Mormon, but there is evidence to suggest this about the Book of Abraham. William West, in writing about the Mormons, said "Smith is to translate the whole [papyri] by divine inspiration, and that which is lost, Like Nebuchadnezzar's dream, can be interpreted as well as that which is preserved; and a larger volume than the Bible will be required to contain them." Oliver Cowdery stated (emphasis added by me) "I might continue my communication to a great length upon the different figures and characters represented upon the two rolls, but I have no doubt my subject has already become sufficiently prolix for your patience: I will therefore soon cease for the present.—When the translation of these valuable documents will be completed, I am unable to say; neither can I give you a probable idea how large volumes they will make; but judging from their size, and the comprehensiveness of the language, one might reasonable expect to see a sufficient to develop much upon the mighty acts of the ancient men of God, and of his dealing with the children of men when they saw him face to face. Could I also share a quote from Robert K. Ritner that does a good job of summarizing my observations regarding the apologists' and church's approach to Book of Abraham explanations: "Far too often, the LDS approach has been to find individual minor identifications or remote possibilities that cannot in sum either explain or justify the Book of Abraham. The new LDS citations of sources that are of minor relevance, misleading or false does not advance the cause of the church and its disputed scripture." This succinctly summarizes my recent exchange with Robert Smith regarding the book. . .
Anon 10:08- You are talking gibberish just so you can feel good about yourself... your psychology is fascinating. Yes, unlike you, I do feel good about myself. And yes, to the intellectually weak such as yourself, it does sound like gibberish. Of course Jeff's 6:38 rant of grieving, admissions, and travesties is gibberish. The simplest explanation for this probably just to make himself feel better. The deeper explanation explains is his need to feel better. Anon 3:31 made it clear their reason to feel better, standing up to someone using bullying tactics, for cowering to bulling tactics really makes one feel better. So Anon 11:54, your post was a need to make you feel better. Why did you need to feel better? Wait, you're saying you got the best of Robert F. Smith? I must have missed something. Was this on a different blog? Always appreciate the helpful clairvoyance to tell me exactly how I am feeling and what is in my heart and mind. For those who doubt reincarnation, this can be taken as tentative evidence that it works, at least for the great mind reader, Fawn Brodie. Welcome back! Anon 11:54 says resorted to gibberish they way to you did is just to make yourself feel better. Do you have a better theory? Jeff @6:43 - It should be comforting that someone can guess to what you are feeling and what is in your heart and mind when not even you can tell us. May be if you were not so focus and reader others' minds [Grieving anon think something is a travesty], you could reader your own. I’m not sure I said or even implied that. Curious why your mind went there. I’m calling out the fact that, when it comes to the Book of Abraham, the apologetic tact is to point to items that are kind of like what’s found in the book, but have no direct relevance to justifying its claim to antiquity. This is easily seen in Brother Smith’s recent grasping at irrelevant straws to try to explain why a modern rhetorical device is present in a supposed ancient document. Mormon apologetic strategy seems to be to attempt to muddy the water enough that nothing can be known with any level of certainty. They seek to sow doubt and confusion rather than proclaim truth.